Stay one block from Linkoping's shopping streets and magnificent cathedral, and 150 metres from the central station. Hop in our sauna and prepare for tomorrow’s events with maybe a trip to the Swedish Airforce Museum. If you’re visiting in the summer, don’t miss a visit to Bosse’s ice cream parlour. Venture away from our hotel to explore the attractions in Linkoping. Just a block from Scandic Frimurarehotellet are the city's shopping streets and beautiful cathedral. Gamla Linkoping and the Swedish Air Force Museum are both popular excursions within easy reach of our hotel. Go for a walk along the Stangan river or jog through Rydskogen forest. Our hotel is located close to the railway station and just 3 km from Linkoping Airport. In our traditional hotel restaurant you can choose from many deliciously interesting dishes on its large and varied menu. At Scandic Frimurarehotellet you can gather new energy in our modern gym, or unwind in our relaxation suite. We also have 10 meeting facilities for 8–180 people. Frimis restaurant is all about delicious food and good service in a cosy and relaxing environment. 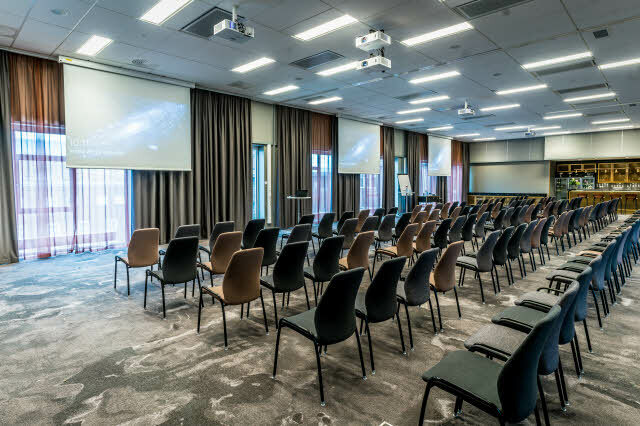 Thanks to the entirely new design of our meeting rooms and improved logistics, Scandic Frimurarehotellet offers the best possible conditions for a successful meeting.